- is my planner FREE ... it is virtually free if you use it and it starts earning you hundred's / thousands per month in additional income.... right ? ! - can you talk to Dave directly... if you email him and include lots of information about yourself (family/career/mlm success, etc...) then he knows that you are serious and he will help anyone who tries to become a Craftsman at their mlm trade ! - if you can beat DK at racquetball... you can get your planner 1/2 price ! - Gain the skills necessary to recruit “10 new people in 10 days”. - We’ll provide you with strategies you can use to teach your group how to earn “$500 in 72 hours”. - You’ll learn secrets that will virtually guarantee that you’ll earn at least “$100,000 in the next 18 months”! - This cassette will tell you where you can get “the 12 secrets network marketing professionals use to build their huge downlines”. - We’ll expose you to a tool that will prevent you from making one of the 10 biggest mistakes that prevent distributors from becoming top income earner’s”. We’re not going to ask you to join a business opportunity, nor are we going to try to jam some worthless product down your throat. What we will do is help you make an “informed decision” on attaining one of the most valuable network marketing tools ever created... that will help you make money. Unlike most people who call you and say: “Stop doing what you’re doing and do what I’m doing”…. Here’s our pitch: “We think that what you’re doing is great, and we’re here to help”! Isn’t it refreshing to finally be approached by professionals who actually support what you’re doing. And the best part about our presentation is, this amazing tool isn’t going to cost you a dime! Are we introducing a new product?… Not quite. It may be new to you, but our powerful tools have been around for almost a decade building incredible testimonial stories for thousands of our clients. Perhaps you’ve already seen a distributor carrying our system and didn’t have the opportunity to investigate the ways it could help you. Well in just a few minutes, you are going to wonder how you ever worked your business without it. You’ll want to find out how you and your downline can get your hands on one. Are you ready? This tape is about to change your life forever. It should give you confidence to know that the individual who invented this powerful tool has “credentials” two pages long! Some of his clients have maintained product loyalty for a decade, while powerful industry notables have dubbed him “the world’s authority” in his field. We’d like to introduce to you a man named David Klaybor, the President of PowerLine Systems, a 10-year-old training and consulting firm based in southern California. Perhaps you recognize the name? PowerLine has instant name recognition among industry leaders. Mr. Klaybor’s workshops, tools, and services have been one of the best-kept secrets in the industry. Why, you ask? Because many distributors, in an effort to maintain a competitive advantage over others, have not wanted to share the revolutionary PowerLine products with you or anyone other than their immediate downline. The designer of this amazing product doesn’t have an agent or PR firm promoting his work… but quietly, his revolutionary teaching technologies have been producing results in tens of thousands of peoples lives. It should give you confidence to know that, to date, Mr. Klaybor has helped his clients produce over $190 million dollars in additional sales… do you know one of the luck individuals who were paid commissions on any of this money? Some of David’s clients have gone on to become millionaires! For almost a decade, David’s unique products have been featured on the pages of industry catalogs. He is honored that his tools are recommended by many of the biggest celebrities in the multi-level marketing industry. Perhaps you’re one of the tens of thousands of fortunate distributors who have witnessed one of his powerful presentations? Most people do not know that Mr. Klaybor has been in the teaching business for over two decades. David is passionate about helping other people achieve their goals. He started his teaching career by becoming a flight instructor, and went on to fly commercial jets as an airline Captain. He weaves the successful strategies used in the aviation industry, into the fabric of the “systems” he offers you today. You’ll be surprised by his fresh new approach to helping network marketers build their businesses. To industry veterans who have watched David develop over the years, his reputation is that of a talented distributor who has consistently broken sales records building 4 different sales organizations. Moreover he’s authored 6 personal development books, been featured in countless magazine articles, designed the world’s most powerful MLM business planner, and published his own business magazine. For over a year, he participated in a national radio talk show on business and network marketing. It should give you confidence to know that this “personal development coach”, has a long-term track record of success. He is not a flash-in-the-pan over-night wonder. His influence on the industry has forever altered the course of history… and he can change your destiny too! You can harness all of David’s expertise so you can answer your toughest questions and build your dreams. A decade of consistent achievements in producing results in others have brought him continuous word-of-mouth business. If your upline is “hard to get a hold of”, new to the business, or you are an abandoned “industry-orphan”… Mr. Klaybor can become your surrogate sponsor. All you have to do is ask, and David will go out of his way to assist you with your toughest problems. This should please everyone in your upline as well as your company founders. None of our products or services compete with any of your existing company’s programs. Our job is to augment, subsidize, and compliment everything you’ve been taught by your leadership… not disrupt it. We are your allies, you can count on us to be there when you need help… we are certainly not a threat. - it means David has the experience to help you retail more product and recruit more new distributors than you ever have in your life. - He’s made all the mistakes you’re destined to make yourselves, therefore you can avoid these pitfalls and reach your goals 3-5 years ahead of schedule! - This means you could live in your dream house, drive your dream car, take longer vacations, and retire sooner. - He can prevent you from looking foolish in front of your prospects, friends, neighbors and family members. - David will help you clean-up your messy desk and follow up on all the promises you made to your clients. - He’ll help you develop more prospects, communicate more effectively, and manage your time better. He’s a normal person who’s learned how to overcome all the pitfalls you’ve encountered or will encounter soon. If you’re willing to follow directions, he will show you how to break sales records, win bonuses, win a luxury company car, win a dream vacation, or get your picture in your company magazine! Isn’t this the kind of “success performance” you’re looking for… the kind of lifestyle you deserve? David’s main focus is his training operation based in Southern California. He’s dedicated the last ten years of his life building career-oriented network marketing professionals. His message is “different” than most teachers you’ve heard. Mr. Klaybor prides himself on going beyond just: “exposing” you to the top secrets that have enabled privileged individuals in this industry to earn outrageous amounts of income… he’s insistent that his training products help you actually “install” these life-changing formulas into your brain! Motivational “entertaining” sermons presented by good-looking, well-dressed, successful people can be helpful… but we at PowerLine understand that it takes a “deliver mechanism”, like the PowerLine System, to help you physically change your current “less-productive” habit patterns into new “income-producing” habit patterns. What are the methods you are currently using to “install” your companies information into your brain? Are you studying your companies training manual and tapes each week? Are you role-playing or acting-out recruiting situations or retail sales presentations? Are you getting together in support groups in an effort to learn the things that will help you recruit prospects? What exactly are you doing to change your destiny? If you don’t have a serious plan, you’re not alone. It’s hard to learn a new career without studying for hours and hours. Developing yourself into the kind of person who can earn a six-figure per year income is not as easy as some folks same, is it?! If it was so easy to do, everyone in our industry would be making lots of money. When you think about the leaders in your company, what do they all have in common? Although we can suggest that they’re all very talented at the “networking business”… what specifically can we say that makes them all the money? The fact of the matter is, they’re all much better than you are at communicating effectively with their prospects, aren’t they?! They also have the ability to “close their clients” and “get the check”. We’re making a lot of sense here, aren’t we? It all boils down to communication. You either can do it, or you can’t. How good of a communicator are you? Mr. Klaybor will help you communicate better than you ever have in your life. Most human beings are naturally lazy and are not willing to do what it takes to succeed in the network industry. 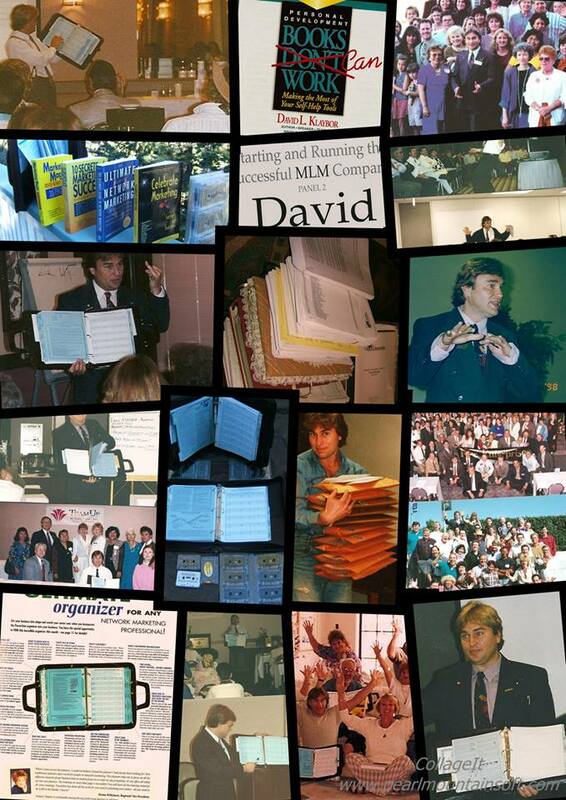 David’s genius lies in his ability to develop “success systems” that do not require lots of “studying”. He’s brilliant because he has the ability to create programs that work for normal “mortal” human beings like you and me. This is what is making this man one of the most sought after trainers in the world. Let me ask you a few questions……..? even be higher than many people earning millions. fanny off to earn $10,000 a month, wouldn’t you? - So what are the major differences between the successful people earning all of the big money in your company and the rest of us?……. (pause), It all boils down to the many sub-sets relating to a persons ability to “communicate effectively” and to do all the important things required to run a professional network marketing business. The top producers in the industry possess this knowledge and you don’t… it’s just that simple. Do you think these people were born with this information, of course not. They had to acquire it just like you. But the people you read about in your company magazine went one step further than 90% of the others in their company. These leaders managed to “install” the success formulas into their brains, and then use this knowledge every day to get further and further ahead of you. Everyday they speak with prospects and move further ahead… while everyday you interact with prospects and get further behind. And it doesn’t have to be this way. You can change this situation. You can develop the skills these top income earners use to build their businesses. All you need is to follow a system that duplicates the way these top leaders behave. David knows the secrets you seek. He’s willing to share them with you. And most importantly, he can help you “install” this critical information into your subconscious mind. Once it’s in there, you own it for life and can use it to reach your dreams. Without this specialized data, you are left to stumble forward trying to build a business… always wondering why it’s “not happening” for you. Thousands of people call to tell us how hard they’re working, and then tell us how depressed they are because they’re not reaping the rewards they had hoped for. Is this a fair representation of what you are witnessing so far in this business? Well, this tape can finally be the answer you’ve been waiting for! It’s not your fault. You just haven’t had a “system” to use that’ll bridge the distance between the intelligence you clearly possess and the money you do not have… that you certainly deserve. If we focused a camera on you and a prospect interacting… and video-taped you “pitching” your companies business opportunity or explaining your companies products, how would your “film presentation” stack-up against a top income earners presentation? The higher ranking leaders would do a much better job articulating and presenting your companies opportunity, wouldn’t they?! Of course this is true. This is one of the most compelling reasons for the differences in your income vs. theirs. They talk better than you do. It would be easy to recognize this condition if you could see yourself on video tape. Now, if it’s true that your IQ is equal to theirs, and that your drive determination and ability to “work hard” is equal to theirs, the area that needs attention in your business is your ability to explain your product and opportunity to the buying public… fair enough? Now it helps if God blessed you with a golden spoon in your mouth, gave you an out-going personality, natural sales ability, and good looks… but you can even the odds against a person with all of these qualities if you only do one thing: sharpen your networking “skill-sets”. Sure, having a super “attitude” is important, but having superb mlm “skills” will provide you with: confidence, poise, and a natural tendency to emit a “superior attitude” to the outside world! Our job is not only to provide you with the ability to communicate effectively, but we offer a lot more! We give you a tool that will absolutely help you sharpen your skills! If you’re lazy, our products won’t do a thing for you… if you’re tired of working hard and getting nowhere, then we are the answer to your prayers. Do you ever get distracted, off-tract, have a lack-of- focus or get confused about what to do next? Mr. Klaybor has created a tool that helps you keep-focused, enables you to stay on-track, and never lets you get confused about what to do next. We do this by addressing the issue of “event management”. David is the only trainer in the world who dedicates a complete workshop to helping you understand this critical topic. Our tools will help you come to grips with the fact that you’re actually running a real business… and we’ll help you run your business like a business. Our products and services revolve around helping you with all your organization, time management, event management, and follow-up needs. Isn’t it true that if we came to your house… when we looked at your desk, or looked at your day-planner, that we would find both areas a disorganized mess? And wouldn’t you further agree that, secondary to your poor communication skills, it’s this lack of “organizational structure” that’s holding you back from earning the really big money in your company? Why would someone want to join you or buy something from you when your life looks like a disaster area? Be honest, do your actions represent a sign-post warning people to say way from the type of person you are, or are your business activities a beacon for others to emulate, pattern after, role-model, and follow? Most multi-level marketers try to build “a $20,000 per month” business while their lives are a complete mess. Why would anyone ever join you in your business opportunity or buy your product if you give all the outward indications of a bridge that is about to collapse?! We assist you in developing professional following-up skills that enable you to: do what you promised to do, when you said you would do it. Our commitment as a company to you was that you’d never miss an appointment or lose a phone number again. Wouldn’t you agree that PowerLine can help you seriously reduce a lot of business-related stress and pressure? You bet we can. We’re doing it every day for tens of thousands of professional networkers, representing hundreds of business opportunities in 12 countries… and we can do the same for you! The third point we would like to bring to your attention, is that our business products hold you “accountable” for your actions (or lack thereof)… Isn’t it true that you learned the most, grew the most, and became a more mature human being when your parents, teachers, ministers, and employers were looking over your shoulder? You bet you did. We may not have liked it, but it was one of the most important dynamics that made us learn most of the critical knowledge we cherish today. Now that we’ve grown older, a lot of the systems that were in place to keep us on track disappeared and we grew more and more lazy. Most of us are much less aggressive, less active, and not as determined to go places and do new things like we did when we had positive peer pressure. The challenges of adult life inevitably slow us up, ware us down, and stifle our aspirations. And to make it worse, “entrepreneurs” do not like being controlled, told what to do or held accountable to others. So, despite all of our “good intentions” to build a successful business, we all have inherent human weaknesses that are preventing us from creating financial independence. If you plan to be a leader, then you are going to have to admit that you’re going to have to work hard to overcome your inherent human flaws. The people who understand their weaknesses and develop skills, are the very people we see walking across the stage at company conventions. Mr. Klaybor has created the product mortal human beings can use to solve real business building problems. Do not become despondent. Even though we all carry these character flaws, there is hope. Entrepreneurs have some very positive traits that can overcome each human beings deficiencies. When challenged, an independent contractor can rise to the occasion. Entrepreneurs hate to lose. We’d all work 14 hours a day… six days a week… for no pay, in an effort to build our own business, rather than work for $15 dollars an hour for someone else. It’s true, isn’t it?! David comes form a long line of self-employed bread-winners. He hasn’t filed a W-2 form in 17 years. He understands what you like, and what you don’t like. Mr. Klaybor uses his experience to create products and systems that are custom-designed to fit your lifestyle and method of doing business. The PowerLine planner was his solution. It helps entrepreneurs, like you, overcome your built-in “weaknesses” while promoting systems that you’ll naturally gravitate “towards”. David makes you work your business correctly, he reduces the painful activities, while promoting activities that make the journey fun. Are you starting to see how valuable our products might become in your life? We truly can help you earn the above average income you desire. We really can help you win that new car, dream vacation, or bonus your company is offering! Mr. Klaybor will fulfill his promise to help you reach your aspirations by introducing you to an amazing product that looks like a “day planer”…, but don’t ever call it one in front of him. He’s dedicated his life to making people successful operating their in-home networking business. The product of all his hard work led him to produce and introduce the planner he specifically designed to become your complete portable workstation. It’s a “customized” network marketing “business planner”, that is 12 powerful tools combined into 1 convenient zippered, handled, leatherette case. It’s mission is to put critical information you will use every hour of every day right under your nose, “where you need it, when you need it”. We’ll agree, that your company training manual and tapes have lots of vital details you need to operate your business contained within them, but you can’t use these tools while you are talking to a client in a parking lot, restaurant, or elevator. It would look odd if you pulled out your company training materials in front of a prospect, wouldn’t it? Your client would think you are a rookie. It isn’t possible to use your training tapes for similar reasons. Prospects do not want to spend money and time with people that do not appear to know what they’re doing. They want to do business with a “professional”. The solution is simple, you simply need to look, behave, talk and act like a professional networker. An investment in Mr. Klaybor’s planner will force you to behave like a pro. Let us give you an example of some of the things that the planner is and some of the things that it isn’t. The following information isn’t in any particular order… every aspect of the manual is extremely powerful. 1- The planner is an “event manager”. Most people don’t even think about managing events, but if you consider yourself a professional network marketer, you must realize that the industry revolves around “events”. So, if you’re sending out a long distance package, chauffeuring a prospect to an opportunity meeting, putting somebody on a conference or 3-way call, traveling to your company convention, or putting on a home party…these are all examples of mlm events. Even a fax-on-demand or web site visit can become an event situation. If you know how to manage events properly, you are more likely to succeed in the direct sales industry. The PowerLine planner has contained within its covers, the worlds most powerful event management system ever created. This system, alone, could help you earn thousands of extra dollars annually! It’s costing you lots of money if you’re not using our duplicatable program. 2- To help you run your business in a profitable manner, our planner also provides you with an incredible “follow-up system”. How ludicrous is it to think that we can work our networking business, or any marketing program, without initiating some kind of simple method for getting back with our prospects. When you think about it, this really makes sense. What kind of follow-up system are you currently using and how effective has it been working for you? If people keep telling you that you’ve forgotten to do something you promised, we can help. If you’ve forgotten who you gave samples away to, if you miss business appointments, forget birthdays, ignore anniversaries, re-nig on a promise you made to the kids, or forget to pay your bills on time, then you need our program real bad. David will provide you with an uncomplicated “follow-up” system that’s easy to use for (normal) mortal human beings. 3- The planner also comes equipped with a powerful “prospecting system”. I don’t know about you, but many distributors will only go to their “warm market” for a limited time before they feel uncomfortable pitching a new deal to these same people every nine months. David will offer you a system that provides you with a steady stream of suspects and referrals feeding your recruiting pipeline. Whether you have more prospects than you can handle, or if you’ve like the rest of us who’ve run out of people to talk to, Mr. Klaybor’s system will dramatically assist you in your “sorting” endeavors. If you are not currently utilizing some form of prospecting system, you’re most likely not making a lot of money in your business. The more clients you talk to each week, the larger your check will be. Our planner will help you talk competently to more people than you ever have. 4- Another important aspect of the business is how well you handle “downline communications”. We deal with this issue by providing you with an easy- to-use system for communicating effectively with the leaders in your sales organization. If you’ve already built a group, you know it’s not in your best interests to get into an adversarial, uncomfortable, or negative situation with anyone in your income-producing downline. Your ability to successfully and professionally handle inter-personal relationships with the “tougher individuals” in your group is vital to running a profitable and productive organization. Our planner will help you keep track of every conversation you have with all your people. Trust us, if you take notes when you talk to people, and they know you’re writing down the highlights of the conversation, you are less-likely to ever be confronted by someone who says: you never did what you said you would. If they do, just ask them what they have written in their notes. Chances are, they will not have any notes written down and you’ll resolve every disagreement to your satisfaction, without any bloodshed. Your goal is to keep the peace so your downline keeps ordering product every month and doesn’t leave your company. The PowerLine planner is an amazing tool that helps you maintain your leadership role, while reducing stress and increasing productivity. Isn’t this just one more piece of evidence supporting the value of our system? It sure is! 5- David has designed and installed, at no extra charge, a cold market “ad-tracker system”. If you’re participating in swap meets, conventions and/or spending money running newspaper or run magazine ads… you’ll love what we’ve created for you. If you buy leads, Mr. Klaybor has created a 3-part lead management system that will help you convert these leads into a steady stream of monthly cash flow. If you’re one of those distributors who’s building his or her business using prospects collected from cold market environments, it can be very challenging. This is one of the toughest ways to recruit distributors or retail product. David’s solution is one of the finest ever created. This section of the planner can also be used by “mail-order” enthusiasts. So far, the planner seems to have a lot of benefits… and we’ve only told you about half of it’s benefits and features. Lets continue. 6- We do not want you to refer to our manual as a day-planner or time management system because it has so much more to offer. But David understands the importance of “managing time”, so he created a customized day-planner system specifically designed for network marketers! What’s so special about our time management formula? An example of David’s genius is witnessed in how he provides you with an uncomplicated “entrepreneurial” time management system created for people who dislike “standard” time management principals. Do you know anybody who pre-plans his or her day and prioritizes items each morning before they start their work? There are very few of these people, indeed. How many entrepreneurs do you know that really write down their goals for the month, the week, or the year? If you’re one of the rare individuals who follow this regime, we applaud you. David likes to ask people like you to stand up in class, and show the multitudes your extra-ordinary abilities. Employee’s who work within a structured corporate environment are the usual disciples that follow the standard Franklin or Day-Runner-type time management programs. And we have to confess, the standard time management strategies taught by any of the day-planner manufactures would work if anyone followed their rules. But David poses a compelling question: “can mortal human beings follow the directions laid down by these machine-like time management guru’s…?” Our research indicates that less than 5% of the worlds business people consistently perform these rituals. So no matter how great these time management methods sound, no mortal person is going to follow these strategies for very long. David is one of the only people in the world willing to challenge the status-quo time management teachings. His studies are very conclusive: complicated time management strategies are designed for machines… not fragile, emotional, normal human beings. Especially not entrepreneurs like you and me. Think about it, corporations hire millions of middle managers and billions of secretaries to perform the standard time management strategies that constitute what most people call “the bureaucratic mess”. These time management formulas may work well for big companies, BUT, entrepreneur’s, are an entirely different breed of business person. They like to shoot from the hip. They hate limitations and move toward creativity and “freedom of expression”. They are free-spirited “individualists” who like to “wing it” and hate being controlled by others. Most network marketers want to leave the corporate world, with all it’s rules and regulations, to run freely through life without burdensome time management restraints. Their goal is to “stumble-forward” doing things on the fly. Does this describe you? We know how you feel and we’ve created a system, “perfect”, for the way you think. Although we agree with the standard time management theories, we’re just saying that most entrepreneurs won’t follow these rules and perform standard time management strategies no matter how valid the argument is to: pre-plan your day and prioritize items. Now you know why David had to separate himself from the normal mold and why he created a time management system for real entrepreneurs. If you hate standard time management concepts, you’ll love his system. But even if you’re an advocate of standard time management formulas, do not panic, David did not abandon you. His planner adequately satisfies both parties’ tastes. If you’re a standard day-planner enthusiast, you will not be disappointed because Mr. Klaybor has also included all the columns, box’s, and attention to detail you crave. So, from now on, when you hear someone describe David as a Time Management expert, you know the real story behind the man’s theories. 7- In an effort to help people come to grips with their “reason for being”… David installed a “goal and project management system” to help you succeed. Since everyone’s was always telling David to write down his goals and read them everyday, the very first section in his planner became the goal management section. This wonderful area of the planner enables you to finally follow this important business success strategy. Reading your goals, is a very important step in getting your day initiated properly. With David’s system, you’re going to read your goals at least once a week, or certainly more than all your friends! I hope you’d agree that this gives you just one more chance to become better than all the other people who are competing against you. There’s a saying: “if you don’t have written goals, you’ll work for someone who does”! How does this statement apply to you? Are you currently building someone else’s dream, or are you clearly focused on doing whatever you want to do in life? Chances are, you’re part of the 95% of the population that do not have your goals written down. The next time a seminar leader asks the audience, “how many people here have written goals”? Instead of looking foolish, in an ocean of distributors, you’re going to one of the only people who’ll be able to hold your hand high and show everyone in the room that you have a system for managing your goals. You are going to look like a real professional in front of your prospects and downline. Wouldn’t you like to be the person who looks like he or she is the person who’s doing things the right way?! Do you think people would want to be recruited by a person like you or with one of the others who do not have written goals? David’s thought of everything, hasn’t he?! 8- The planner has enough room to hold your company “pitch book” within the binder. Isn’t this fantastic! You won’t have to carry two systems, you can fit them all in one place. The planner is designed using the roomy 8 ½ x’s 11 format with a 2 inch ring. This will allow you to have your complete system with you so you can give presentations in the restaurant, in an elevator, in a car, or anywhere that you are….. as long as you’ve got your planner with you, you’re prepared to do business. Most distributors are not prepared to perform a business presentation when they meet someone during the day. With our system, you’ll look very professional in front of your clients with only a moments notice. You would be wise to follow the success principals stated in the boy scouts motto: “Always be prepared”. If you are, you’re going to sponsor a few more people each month… and this will translate into tens of thousands of dollars by the end of the year. Mr. Klaybor again demonstrates his ability to provide you with a tool you need to succeed. 9- Another extremely powerful benefit of the planner is the fact that it functions as an amazing “independent training system”. Although your company may offer some great training materials, you will be impressed with the additional materials we supply you. Depending on the year or model planner you’ve purchased there are 14 to 23 different tabbed section sheets jam-packed with tons of money-making information. You can use the information laid-out on the planner pages as a lesson-plan, syllabus or outline for a training event you may be hosting. You can use the planner one-on-one with one of your downline members who has a question about running their business. And best of all, if you both have the planner, you will not have to visit one another in person, you can answer any questions over the phone. This saves both of you a lot of time and expense while you quickly solve problems. This is real life time management that works. Whether you want to help someone place an ad, send out a long-distance sponsoring package, perform a 3-way call, or any other activity… we supply you with hundreds of topics or ideas you can use from the planner to supplement your existing training program. Some people have used the planner to create a whole new series of exciting new training events for their downlines. For example: here’s one way David uses his planner to maximize his time… when a distributor calls and wants to know something about 3-way or conference calling, David has his team member “tab over” to the appropriate tab sheet, read all the information on the pages ,and then call him back with more detailed questions. Many people wind-up answering their own questions and never call him back. This eliminates David from having to say the same things over and over again… and allows him to focus on the relevant questions his distributors really need answered. Wouldn’t you agree that this method helps you maximize your time? We could spend an hour sharing with you all the ways people have been using their planners to enhance their training programs, but rest assured, this is just another way you’ll utilize this planner to earn extra money. It really is a tool that will help you and your downline prosper. 10- This next benefit demonstrates another aspect of Mr. Klaybor’s design genius. Through his research, you will find all the things that make an encyclopedia work, installed on both sides of the many “tab sheets” of the PowerLine planner. Those who use his system applaud Mr. Klaybor for placing vital information right under their nose, “where they need it, when they need it”, as they perform their usual mlm tasks. These design enhancements enable David’s clients to use graphs, charts, definition sections, and answers to objections in their efforts to retail, recruit and train. But, without your clients knowing it, and right under your nose… you’ll have closing phraseology, scripts and great questions to ask your prospects. And unlike any other system in the world, David provides you with this data at the very moment you’re executing your recruitment sequence. Isn’t this exactly where you want this kind of life-changing information? Sure it is… this is what helped Mr. Klaybor break sales records, and it’s this revolutionary technology that has provided many of David’s clients to do the same! Aren’t you tired of getting rejected or put-off by the people you make your presentations too? Isn’t it about time that you put another 10 new distributor’s into your group? Our system is the answer and solution to your recruiting problems. It should be clear to you how David helps you communicate better in the field. All you have to do is carry the planner every day. It’s that easy. So when somebody snips: “is this one of them pyramid schemes”, or, “I don’t have the time”, or, “is this multi-level marketing”… you’ll have 3 different sections in the planner to “tab” to in order to neutralize your clients concerns. Unlike using your company training manual, you can perform the PowerLine “assistance maneuver” right in front of your clients and you won’t look like a rookie. In fact, unlike most people that your clients encounter, you will look like a person who actually knows what they’re doing and your prospect will never figure out you’re using your planner to recruit them. How many times have you witnessed an unprofessional multi-level presentation and said to yourself, I never want to look like this stammering sophomore in front of “my” prospects. 11- The planner is also your “portable filing cabinet” designed specifically to organize all your important business information. Can you imagine carrying everything you need to be successful, neatly laid-out in a professional looking binder. The planner is so easy to use… when one of your downline distributors calls you to execute a 3-way call, all you have to do is “tab-over” to the 3-way call section in the planner and register all the important information while you speak. Instead of using the back of an envelop, ripping off a piece of a grocery bag, or scribbling notes on a post-it-note pad-sheet… you grab your planner and file the information where you can easily find it again. You’ll never lose names, addresses and phone numbers again. You are going to be in a position to follow-up on the promises you made and you won’t forget about pending events. Our system forces you to be accountable for what you say and do… you’re also going to be in a position to hold others accountable for the commitments they made to you. If you give a sample to a potential prospect, log all the appropriate information in the “retail/sample log section of the planner. What if a person, (you’ve been begging to give you referrals), finally breaks down and gives you a few names. Where would you currently log this kind of information? What system do you have in place to handle this activity? Most people do not have any professional way of tracking any referrals they get, and they’re not following any “system” to convert these valuable leads into cash. If you don’t have a system, then you need ours. If you owed our planner system, you would be provided with a customized section titled “Referral’s”. To find this section, just look for the referral “tab” and open the section so you can take notes. If you can use your imagination and visualize this interaction between you and your prospect, your client would clearly see that you are the only person on the planet they have encountered who has a specialized section in their planner dedicated specifically to collecting and managing referrals. You must believe us, this will impress your client. You’re going to be the only network marketer they’ve met that seems to run their business in a professional manner. The “referral tab”, broadcasts to your prospects that: “you’re a paid professional referral getter”. Consider this point for a minute… if it’s me against you and you’re standing there with your note pad, scrap of paper, or your bulging little day-planner, who do you think is going to win? I’ve got my PowerLine planner that contains my pitch book, answers to my prospects objections, great questions to ask, plenty of customized sections to register important information, and tons of other valuable data at my fingertips… and what do you have to help you win the prospect over to you? I’ll put a person with our planner against someone without it any day of the week… and I’m certain that the person using our planner will have the upper hand! You need our system to organize your disorganized work environment while creating the professional image you want to emit to the public. Now that we’ve shared the 11 major “systems” included in our planner, we still have a lot more to share. So lets learn a few more money making aspects a person receives when they invest in our system. All of the planner’s power is harnessed within a luxurious leatherette’ 3-ring binder. The planner comes in Black or Burgundy, complete with a zippered collar to seal in all your important paperwork. Our top-of-the-line planner has handles so you can easily carry the case. This system is “all business” and you have ample room to write. Depending on which model you own, each system contains 200 to 250 sheets with 14 to 23 sections inside of it. Do not let the planner’s size overwhelm you. That would be a grave mistake. You’re not intimidated by a dictionary or telephone book, are you? Of course not. If you catch our drift, our system is not anymore complicated to use than one of these reference manuals. An eighth-grader could use it, in fact, it is very easy-to-use and makes an excellent traveling companion. Think of it as your personal secretary. Lets deal with the some of the possible questions or concerns you might have. If the planner is so easy-to-use, then why do some people hesitate to get it? Excellent question. All humans try to avoid anything having to do with work. We’re all afraid of any tool that has lots of pages, lots of tabs and is thick and heavy. It is a normal human reaction for some people to be threatened by the planner’s size and use this issue as an excuse so they don’t have to change their old unproductive habit patterns. Any skepticism will be removed once a person does their homework… like listening to this tape. Once you do your investigation, most people find out that our system is the least-complicated, most-professional method of working the business in the world. If you’re using a smaller planner, do not be afraid to move up to a larger-sized planner… and for heavens sake, do not buy into the “smaller is simpler” theory. Smaller systems are not “less threatening”, they just give you less… period. Since our sub-conscience minds were negatively conditioned and programmed from our college days when we where forced to study hundreds of pages every night as homework, most people get scared every time they see or touch thick heavy publications. Any fear a person would have of our planner is unfounded, without merit, and can be easily overcome by talking to a “planner-user” who only started earning money after they invested in our system. Person after person tells us the same story… they say they were a bit intimidated with the planner when they got it, and quickly overcame their concerns as they discovered how simple it was to use. So if you encounter someone who believes the planner is tough, tell them they’re a weenie, and to do their homework before they pre-judge our system. In every section at the top of each page, David incorporated another ingenious design strategy… he placed a “checklist” there for you to use while you’re executing an important business activity. He did this because he was taught to do this when he worked as an airline captain. The #1 reason why thousands of airplanes successfully chauffeur millions of people all over the world each day, (with average people flying the aircraft up in the cockpit), is due to the use and implementation of checklists. Whether you’re part of the maintenance team, or the flight crew, anytime you do a flight-related activity; you must use a checklist. And guess what, the system works marvelously, doesn’t it?! Therefore it only made sense for David to weave the checklist technology into the fabric of his planner. We’ve got stacks of testimonials on our voice mail system, in our E-mail message center, and in writing, all expressing the fact that: “Gosh darn it, that planner-thing you sold me really worked”. Like anything new in our lives, many clients were a little bit scared to work the system at first, but once they got into it, they realized how simple, duplicable, and just plane easy it was to get started. 99.9% of our clients find out that the planner paid for itself within weeks. How foolish some of us are that we believe we can make millions in this industry without making some serious changes to the way you’re currently working our business. Change is inevitable, and change is good. If you do not change, you will become obsolete and superceded by those people who stay on the cutting edge. Our planner is creating a revolution. Our system is leading the evolution of the way distributors work their business. Our planner was the first network planner ever made. It’s the “original system” and the only reason why you see planners in other network operations. David is directly responsible for planners being popular in our industry. There are no systems in the world that come close to offering 1/10th as much as what we offer you. Why is the planner working so well for your clients?… lets review it. If you’re logging the names of people you’ve performed a 3-way call with month after month… a person can find that information again, and you’re going to be more successful than those distributors who do not keep track of this kind of information. If you’re logging the names of all the people you gave out samples to, you’re going to follow-up more often, sell more products and recruit more distributors than ever before. If you’re logging all the referrals you receive as well as keeping track of all the packages that you’re sending out, you’re guaranteed to rise above your peers. If you’re logging the names of people you invite to listen to conference calls, if you’re reading your goals every day, if you’re using your unique time-management strategies, and if you’re communicating professionally with your down-line… you have to be “in the running” to win your company bonuses. This is why our products are helping people make real money, when they never did before. We’re not asking you to write down anything more than you normally would. Currently, most of you are writing notes on the scraps of paper that are laying in a mess all over your desk. When David visits clients in their homes or in their offices, (9 out of 10 of you), are working your business’s from disaster areas. There's junk falling out of your desk drawers, note pads are lost under the seat cushions of your sofa, you have business cards lying under the seat in your car, there are post-it-notes from 1988 still pinned to the cork board next to your desk, and there are memos lying in the lint behind your refrigerator! Humans are a messy and disorganized species… our garages are cluttered, our basements are a war-zone, and our attic’s are cluttered dust-bowls… We must become aware that the messes in our lives are costing us emotionally and financially. Entrepreneurs like to exist within an “organized mess”, and they don’t like to be told that they have to clean up their mess. But once the mess is clean they’re very happy. And when we’re in a good mood, we get a lot more accomplished, don’t we?! Therefore, another important strategy David has incorporated into his teaching's, is to suggest that you clean up some of the messes in your life. As simple as this system sounds, if you organize and clean up your life, powerful revenue producing factors are triggered and set in motion. How are you doing things now? I mean really… how are you currently running your business today? Some of you have been in the industry 3 years, 5 years, 10 years… and have been exposed to a lot of opportunities. Sure, you’ve learned a lot over the years, but why has the big money avoided you so far? David is certain that he would have never been so successful so soon, if he had not created his “system”. Mr. Klaybor doesn’t like to think of himself as a protegee. He swears that he’s not any smarter than anyone else... he claims he is a normal person who realized he had better have a tool that would make him better than the competition! He didn’t need one separate system here, and one separate system there, he kind-of needed a system that was all together in one place. So he invented the PowerLine planner and made it available to you. During a PowerLine workshop, David ultimately asks his audience: “ Is knowledge power”? Usually ¾ of the people raise their hands and say “yes”. Unfortunately these people are confused regarding this critical “success principal”. If you handed us your resume’ right now, it would tell us how super, amazing, and great you have been in your life. If you then handed us a copy of your bank statement, wouldn’t you agree that the amount of money you have in your account does not usually add-up to the amount of knowledge you have stated on your resume? It doesn’t seem to add up... knowledge doesn’t seem to equal success. Why are so many well-educated individuals so broke? It should be clear to you that you need a bridge between how smart you think you are, and how much money you wish you had. David was tired of buying more books, tapes and planners… and getting nowhere, so he made it his life’s purpose to find out how to “turn knowledge into cash”. And that’s exactly what he did. ”. David will remind you what Napoleon Hill said in his best-selling book titled: “Think and grow rich”. He discovered that knowledge alone did not always create power… but rather it was the organization of knowledge, that was then put into action, that created certain success. It’s not a one–step process, it’s a three-step formula. 1- acquire the secrets you need, 2- organized the data into a business plan or blue print to follow, and then 3- take action on the plan you created. This is exactly what Mr. Klaybor did! His PowerLine system is a collection of the secrets you seek from the masters of our industry. The data is then organized and laid-out so we can “access” this information. And then everything about the planner is designed so you can take effective action on the success formulas provided. The PowerLine System is the “delivery mechanism solution” gained from of all David’s research. It follows hundreds of success principals all of us subscribe to, but rarely follow. Our tools provide you with a real opportunity to change your life, while other nicely packaged, well marketed products simply can’t. When an airplane crashes, it’s usually due to “pilot error”. The person responsible for the successful outcome of the flight usually did not use their checklist. You would be shocked if the pilot flying the plane you were traveling on, did not use his checklist, wouldn’t you?! Yet everyday in your multi-level marketing business you launch into an activity without using your checklist. Is it any wonder that you’re “crashing and burning” in your business, or just not being as productive as you could be. This negative condition should be called “distributor error”. To remedy this situation David put little checklists in all the different sections of the planner. All of the strategies we’ve described so far are built into the planner so you can make income fast. It helped David build huge organizations and break records. It also helped thousands of his clients do the same. Why is our system so easy- to- use and duplicable? Because anybody can pass a test when you’ve got the answers under your nose. All you gotta do is carry this planner with you. Don’t complain about the price, don’t complain about the color, and be a whiner who’s always looking for excuses. Just use it, live long and prosper. If you’re looking to purchase a system that’s gonna work to help you make a five-figure per month income within a realistic period of time, then stop procrastinating and order yours today. There is nobody in the world that has dedicated more time, money and effort into this issue of: “multi-level business planners”….. nobody. You can not even compare our system to a Franklin or Day Runner type of product. These items aren’t even in the same category. Oh, we admit they’re good for people who work within the corporate environment, but these well-intentioned planner manufacturers do not know much about designing planners for entrepreneurs. Owning a PowerLine System vs. a Day-Timer system is like using a chain saw against a handsaw! You’ll cut a cord of wood with our power tool before you cut through your first log with any other planner. That’s how good our system is. If you question our claims, David will debate anyone, anytime, any place to defend his research. When you see our system, know that the planner’s been ripped apart, debated, edited, tested, modified, re-tested, challenged, up-graded, and finally proven to work for normal people. We have reamed this thing backwards and forwards, so in the beginning, trust in us that it is going to work just fine for you. And to be quite honest, even with the improvements made over the years, the basic system hasn’t changed much. It’s a brilliant little system. The PowerLine name and reputation will add third-party credibility to some of the activities that you’re doing… especially if we put on a workshop with you. David and his staff already have a reputation for increasing attendance at your local, regional or national events. We even add excitement to your conference calls. Many network marketing operations want all their distributors using the PowerLine planner, so they list it on their private company order forms. Once the planner is in the hands of lots of distributors, all linked up in one group, it takes on and develops an amazing new power. It starts making people “accountable” to each other. As we said earlier, when you were young, all the authority figures in you life held you accountable to behave in a mature, pro-active, growth-oriented way. Even though we did not like to study our homework, wash the dog, cut the grass, clean our rooms, go to church, eat our vegetables, be home before curfew, sing Christmas carols, get our hair cut, brush our teeth, or say “thank you” when someone gave us a gift… I’m sure you would agree that we’re all better individuals for it. Well, when the planner gets into the hands of 10 or more people, it starts making people accountable again, in much the same way it did when you were young. Your upline’s gotta know you’ve got this planner so they can look at it to see what you’re doing and what you’re not doing to build your business. This is one of the major problems associated with an in-home business… too many people work alone. Gangs, clans, families, Jenny-Craig members, military groups, Away distributor’s, Japanese firms, and ministries are all examples of groups of people who understand the “power of the herd”. Using the planner, David teaches you ways that you can link yourself up with a “peer group” to create synergy through group dynamics. David has coined the term: “Herd Effect” and capitalizes on it whenever he can... you should embrace this technology as well. Wouldn’t it be fantastic if all the people in your group were currently using our system?! Of course it would. They’d be recruiting people in record numbers as well as selling more products than you have ever witnessed before. Take it upon yourself to get our business planner into the hands of all the people in your down-line. They’ve got to know that you’re going to hold them “accountable” for working their business like craftsmen, like a tradesmen, like the professionals they profess they want to become. 1- “How can I get the planner for free?” For those of you who are making good money, this will not be an issue. But for those of you who simply can not afford the $200 dollar price tag, we offer all of you dedicated networkers’ a pathway to acquire our powerful tools for free. In special cases we’ll allow qualified people to register as PowerLine distributors. You buy the planner at wholesale and sell it at retail. Your commissions will be collected and credited to your account. Once it reaches the purchase price of the planner, you will have earned yours for free. Some distributors create special PowerLine coupons they enclose with all their correspondence, or display inside their newsletters. Some people list us in their catalogs while others learn to give generic PowerLine workshops and earn thousands of extra dollars each month to sharpen their skills. They find it valuable to become known as a “generic” mlm instructor. You can give a copy of this tape to people in your downline, or even people in other companies. Do not be misled by our offer, we do not want lots of looky-loo’s contacting us to become distributor’s… only special individuals who really love teaching and helping others will be considered for this program. But more importantly, if you use the planner like you’re suppose to, the planner will be directly responsible for helping you recruit a handful of new people in the first few weeks you own it. The commissions you earn from these new distributors will easily pay for the planner many times over. Our system has the capability to make you thousands of extra dollars. Therefore, know one can say the planner cost them a dime. It’s just a “temporary” investment of $200.00, and then you’re going to get your money back many times over. And if you think David’s training hasn’t made any millionaires, you’d be dead wrong. No matter how many lazy people we come in contact with, it’s refreshing to discover that there are a lot of people who really are teachable… they actually follow directions and use the success formulas their given. They are the people who write, fax and send us cards on holidays thanking us for helping them earn a comfortable living. Our clients are the life-blood of our business… they are the people that make all David’s hard work and dedication, worthwhile. 2- The next question asks, who recommends your planner? - It should give you confidence to know that you can buy our planner through the Upline Resource Catalog. David was one of their earliest lifetime subscribers. He is honored that they’ve carried his product for over 7 years. This publicly traded company publishes one of the finest network magazines in the world and we suggest you get to know more about them. - You can also purchase our planner through the Randy Gage Resource Catalog. Randy has become one of the most popular and powerful trainers in the industry. His company has carried the PowerLine planner for over 6 years. David is honored to have been invited to speak at many of Randy’s most exclusive 3-day workshops. - Another industry powerhouse, Don Failla, also offers our planner for sale through his training operation. Don’s probably sold more mlm books than anyone in the world. If you haven’t seen Don in person, make sure you attend one of his events. - You can also buy our product through Gery Carson Services. Gery’s been a record-breaking distributor and offers many services to mlm distributors through his operation in Nebraska. - You can purchase the PowerLine planner through many multi-level marketing operations. Some firms carry the planner as a commissionable item… this means you can earn sales commissions when you purchase our planner from them! - David’s planner is listed or mentioned in many books on network marketing. For example: record-breaking distributor and best selling author Bob Butwin has been a friend of David’s for years and gives a thumbs up to the planner in his book titled: “Street Smart Networking”. - Len Clemmons, renowned multi-level publishing expert, record-breaking distributor and former editor of “MarketWave” magazine, also understands the power of Mr. Klaybor’s planning system. - Rod Cook and Cory Augustine, publishers of another fine watchdog publication called: “MLM Insider”, say David’s system is a valuable tool for any person wanting to get serious about building a large sales organization. - Keith and Linda Laggos, owners of the largest network publication in the world: “Month Makers Monthly”, have been friends with David for almost a decade and feel his products and training seminars are superb. - If you’re not familiar with a new multi-level publication by Jerry Hoffman, it’s an MLM Directory the size of a telephone book. Jerry invited David to contribute an article detailing some of his fascinating training tips and designed a full-page ad so his readers could get a hold of the planner. - Leading MLM attorney Jeff Babener has chosen Mr. Klaybor’s training systems as the topic of 3 articles he’s written… one was printed on the cover of Month Makers Monthly, and the other became the cover story of “Business Start-up Magazine” (a subsidiary of Entrepreneur Magazine)… and a 3 page article in Wealth Building magazine found on most every news stand in the world. - all these people know how committed David is and how dedicated he has been to building career professionals in this industry. . Please forgive us if we did not mention your name, but we could not list all the wonderful professionals who have given up their lives, like Mr. Klaybor has, to make the industry a respectable place to do business. David values his relationships with these veterans, but he also realizes that the life-blood of his business lies in you and your success..
3- How was the PowerLine System born? It’s a simple story. As Mr. Klaybor worked his first business opportunity, he instinctively started designing a “system” he could use to work his business. The 3-ring binder he used just kept growing and growing until it became a full-functioning system others could follow. He passed his blueprint on to his downline. When others noticed the successes David was having moving up in rank through the company, other leaders asked to have his program too. Soon distributors in other network marketing operations started asking for his “success system”. David was overwhelmed with inquiries and over the next 2 years he quietly produced the basic product you see today. It has gone through many up-grades and has been refined to maximize the results he discovered along the way. The important theme here is: David did not create a product to sell for profit… he methodically designed a system for personal use and accidentally ended-up manufacturing business planners. Anyone who knows him well, knows how passionate he is about teaching his system to others. He’s never tried to get rich marketing his products. He could have been a millionaire long ago had he just remained an active distributor. He’s turned down hundreds of offers in order to expose you to formulas that will help you succeed. David’s only had four large downlines during the ten years he’s been in the industry. He is one of the rare professionals who still maintains solid relationships with most of the people he worked with in the past. 4- Another person asks: What size is the planner? Mr. Klaybor is quick to answer, “it’s the size it is suppose to be”. The PowerLine system has ample room to take notes like a professional. You can 3-hole punch “normal sized” paperwork, and have plenty of room to file this important data where you can find it again. You won’t have to stuff, jam, cram, crush or fold your paperwork anymore. Our system is large enough to absorb your “pitch book”, business cards, calculator, pens and most everything else you’ll need to work your business. The research is clear… people who learn how to use a “larger planner” make more money than people operating “smaller ones”. But, for those of you who insist on carrying a smaller-type planner, after 8 years of declining to make one, David’s finally going to make a mini-version of his existing system available to you in 1998. 5- The next question asks: "What if my company already sells a planner or what if I already own a planner? Mr. Klaybor is always sorry to hear from distributor’s who’ve invested in a planner before they discovered the “PowerLine Business System”. It’s unfortunate, but that doesn’t change anything. If you were a carpenter and just bought a new handsaw… and two weeks later you discovered that we could sell you a power saw… what would you do? The answer is perfectly clear, you give your old saw away to some needy craftsman, and invest in the power saw so you can put it to work immediately! It doesn’t really matter how much money you’ve already spent, or what the new one costs, does it? One tool will make you a lot of money, while the obsolete one will make you much less money. If you and a competitor were both trying to recruit the same prospect, you wouldn’t want your competition using our planner against you, would you? After listening to this tape, you ought to know that you would not be in a very good position. The situation is the same if your company offers a day-planner other than ours. You’d be foolish if you purchased an inferior system just because you thought you’d be “disloyal” if you invested in our system. You’re making the right business decision buying ours. Never bend to pier pressure, especially when it could cost you thousands. Stand up for what’s best for you and your families future. Why would you settle for an inferior product just because it’s got your company’s name on the cover? If you want to win bonuses or be featured in your company magazine, then you had better get the best tool for the job… and that would be our system. Producing results is what’s ultimately going to get the attention of your company leaders… that’s what going to make your up-line notice your productivity. Most people who manufacture day-planners are only interested in selling thousands of inexpensive units to the owner of your company. They’re not particularly interested in the success of individual distributors. If they were, they wouldn’t provide you with one of these “little planners”, now would they?! These people aren’t bad people, they’re just ignorant to the specialized needs of your business. They’ve never been successful building a large downline. These businessmen make a living by chopping down trees and buying 55 gallon drums of ink so they can sell something to all the distributors in a multi-level marketing operation. Be real careful with your next planner choice. Make sure you ask about the person who designed the planner you are considering to buy. Ask about the technology they use. It isn’t so hard to buy a planner when you know what you’re looking for! At PowerLine, our whole approach is dramatically different. We are not motivated by profit, but by passion. We aren’t looking to make a cheap product… we won’t compromise price for performance. Our system works because it’s creator understands your businesses. He’s earned celebrity endorsements because he was willing to provide you with all the secrets you need to succeed. We’re pretty darn proud of who we are, where we’ve come from, what we stand for, and the results we’ve achieved for others. So don’t be scared because you’ve got to invest $200.00 dollars in our new system, that would be unfair to you. Don’t throw away all the extra money you would have earned if you used our system, just because you were scared to temporarily invest a few hundred dollars in our planner. We have already agreed that our products are free. You’ll get your money back, so don’t be worried about it. Invest in yourself, you’re worth it. Life is to short to try to work your business the hard way… why be one of the millions of people who aren’t earning what they’re worth in this business?! Maybe you’re supposed to be a millionaire in the year 2002? We’ll help you get started. 9- The next question is… “Will people buy the planner instead of doing their monthly sales quota?” Some distributors mistakenly fear that people in their downline will spend $200.00 dollars on our planner instead of spending that money underneath them where they can make a commission. An investment by one of your downline distributors in our planner will make these people produce more income for you than they would have, had they not bought our system. It would be a selfish mistake to think otherwise. You and your group need to acquire every new weapon “you can get your hands on” to advance your businesses. Over the last 50 years many new tools were introduced that dramatically changed the course of multi-level history… things like: video and audio tapes, 3-way or conference calling, fax-on-demand services, e-mail, voice mail, and the internet. Few people can remember or comprehend the days when a person had to build a business without these tools. One day we’ll all be using videophones, holograms and teleportation… but today Mr. Klaybor is blazing a new trail with his business planner. The next time you see a network distributor carrying “any type of planner”, know that David Klaybor is the “father of mlm planners”. He introduced the world to the validity of these types of systems in 1988. So if you find out that someone in your downline is thinking about buying a planner, you would be hurting yourself if you did not encourage him or her to seriously investigate in acquiring the PowerLine System. Whether you’re a mechanic, a doctor, a secretary, or a carpenter… none of these professionals can work without their “special tools”. Attorneys have their law books… but what unique “tool” is the focal point of the average network marketing distributor? There wasn’t any such device until David invented the PowerLine Business System. Although your company materials are important to succeeding at your business, it would look odd to your prospect if you opened and used your company training manual in front of them. Most training instruments are meant to be “studied” and learned, not used in front of the client like our product is. Additionally, our planner works in harmony with all of your company tools. Encourage your downline members to build their own personal development library. Annually, most people spend more on the outside of their heads, than they do on the inside. For most of us, it can take years of frustration before we finally admit that: what we’re doing may not get us where we want to go. We fight the concept of investing our hard-earned cash in new materials. Make a commitment with us today to take action on the information you’ve gained from this tape. Call us, or someone who carries our product, give them your credit card number and get this system in your hands this week. Just start by using 5 or 7 sections of the planner… don’t try to be superman and think you have to master all twenty sections in the first week. If you spent the time, money, and effort buying leads… if you’re sending information to people out of state… if you took prospects to opportunity meetings… or if you placed people on conference calls, you’d better be using some kind of professional system to follow-up on all these activities. And when you finally call your prospect back, you won’t stick your foot in your mouth if you have David’s planner in front of you. If you had our planner in your lap right now you’d be able to say cool things like: “can you see the value of…” or, “doesn’t it give you confidence to know…” or, “if the results indicated…” or, “will you be starting full-time part-time or just using the products today”!… or, “how do you know when you see a good business opportunity, what do you look for…? Or, “do you like speaking in front of a group”…? Or, “have you ever owned your own business…?” Or, “are you committed to making serious change…?” Or, “are you dissatisfied with your present situation…”.! Wouldn’t it be fantastic if you could impress your clients with phrases like this! You’d recruit a lot more people than you have to-date, wouldn’t you?! So don’t worry about people in your downline buying our planner, if they do, they’ll be producing a lot more money for you over time! It’s our job to show your downline how to buy more of your companies products, not how to buy more of ours. 10- The next question: Is your planner better for new distributors or veteran distributors? Think about it… would you want your new recruit waiting months, or days, before they started reading all your company training materials. I’m sure you would agree that you want them learning as much as they can as early as they could. Learning our system is no different. Consider this: Would you teach your children manners early in life or would you wait until they were teenagers before introducing them to the proper way of doing things? It doesn’t take a brain surgeon to figure this one out. You’d better make it a goal to get your distributors developing winning habit patterns right from the start. Their first few weeks will determine what they do for a long time to come. It may determine whether they ultimately succeed or fail. Perhaps your sponsor did not show you the ropes, wouldn’t it have been great if a person with Mr. Klaybor’s knowledge had gotten you started?! From this date forward, you have no more excuses but to run your business right. From now on you had better at least “log” all the important information related to your business. You’ll need all this information sometime in the near future to follow-up on these prospects you spent so much time, money and effort with. We have people who have followed our instructions and became the “distributor of the year”. We have single parents who’ve been able to quit their jobs and focus more on their kids… we have senior citizens who were living on social security who’ve been able to make it big in later life… we have clients that were wheel-chair bound who found a way to live an exciting life… we have constituents who’ve never been successful in multi-level who are now leaders in their operations. We would like to help you achieve your own success by joining our team. The second part of this issue is, will our system work for veterans? Usually seasoned distributors are the old dogs who hate new tricks. It took them a decade to develop the unproductive habit patterns they embrace. Don’t be one of these persons who’re so set in their ways that you won’t use the new cutting edge technologies. Many veterans have become masters at winging it, and since they have so many contacts in the industry, they always manage to keep stumbling forward. But if you’re a veteran, and you don’t live in your dream house, don’t drive your dream car, or aren’t going on dream vacations, then maybe it’s time to admit that it’s time for a change. We invite you to join our team. So whether you use your company’s training formulas or independents like: Randy Gage, John Kalench, Burke Hedges, Don Failla, John Fogg, Michael Clouse’s or ours… just be sure to use a system that has been proven to work. Fortunately, our system works in conjunction with all of these other fine systems. That’s why independent trainers and mlm company owners can recommend us. We don’t step on anybody’s feet, our teaching formulas are in harmony with, and dovetail into everybody else’s. 11- The next question asks: How much does it cost to operate the planner? Our prices are very economical. We’re probably the least expensive planner to operate in the world. If you own a Day-Runner-type system, it could easily cost you 3 to 5 x’s more. No matter how you look at it, our planner really costs you nothing to own and operate. Unlike other planners, ours is designed to make you more money than it costs you. 12- How do I learn how to use your system? We recommend purchasing the “reprogramming your habit for success” 90 minute training tape when you buy the planner. It’ll help you maximize the investment in your planner. The cassette is worth thousands when you follow it’s directions, but you’ll usually be able to get it for under $10. It will offer you many of the secrets you’ve never been exposed to. Listen to it over and over because most of your questions will be answered and we won’t have to play phone-tag. In addition to the basic tape there are two more-advanced training tools that help you. The first one is for the analytical-type people called: “the advanced training manual”. It’s a detailed manual approximately 100 pages in length that explains every column, box, triangle… and tells you why everything is where it is in the planner. We also have another advanced training product for those of you who are bent on using the planner to increase your income into the five-figure per month category. It’s a 6 cassette series, which is called “turning knowledge into cash”. This super-charged package offers more than 3 ½ hours of David explaining how to use the business planner at a higher level. Your investment in this module would be around $100 dollars, and there is no reason why you couldn’t use this information to earn thousands! …So we suggest you start with the basic system, but if you’re dead-set on becoming a “grand pooba starship commander”, then you might wish to acquire one or both of our advanced training systems. Often-times we offer a special package you can purchase from time to time that offers super-savings for those of you who see the value of getting all of our tools at one time. 13- Can we get personalized training? Absolutely. Either David or one of his trainers can perform a workshop right in your local area. Just call to schedule an appointment. We can perform a short 20 to 30 minute program in conjunction with one of your planned events… we can perform a 30 to 90 minute program with several other speakers… or we can do a stand-alone 1 to 3 hour program. Often times, during these events, we will offer our products at special discount prices, so you will not want to forget your credit card. We support our “ministry” from the sales made at the back of the room. Since we do not charge a lot of money to witness our wealth-building seminars, we anticipate and fully expect the people hosting the seminar to highly recommend the planner. Here’s an example of a basic program that’s worked well. If you decide to host a PowerLine event, it might be wise for you to charge the small sum of “ten dollars per person” so the event is affordable to as many people as possible. Our goal is to get at least 50 people to attend. You now have a $500 budget to work with. You’ll use the money collected at the event to reimburse yourself for the up-front fees you paid to the hotel and airline people in order to secure a spot on our calendar. There will be enough money left over for you to pay for the meeting room and advertising efforts. You can host a private workshop for your group, or you can open the meeting to all network marketing distributor’s in your area. Hosting a “generic event” will provide you with more money to work with and you’ll develop relationships with mlm veterans who would not have normally attended your event otherwise. Establish a budget for the amount of money you expect to collect at the event and plan your expenditures accordingly. The goal of this program is to make the seminar very affordable in an effort to expose Mr. Klaybor’s teaching technologies to the largest group possible. Remember that hundreds of people have paid over $5,000 to witness David’s training in the past when he was a speaker at the 3-day Gage workshops. If you are good at filling a room, another option might be for you to charge $250 per person for an all-day advanced training workshop… or charge $499 for a two-day PowerLine marathon. Under this situation we’ll pay you 25% of the net revenue collected after travel, lodging, hotel and advertising expenses are deducted. We have negotiated many other “special” agreements, so contact us with your ideas and requests. We’ll customize a seminar to fit your needs. We use the planner as our syllabus like a minister uses his Bible. It would be unfair to accuse us of coming out to see you just to “hawk” our products. That would be like accusing a minister of “hawking bibles” from the pulpit! Our clients value and respect the fact that David is passionate and committed to his system, just as much a minister is with his system. Our sales are brisk, our calendar always fills up… so if you would like one of our teachers to share the important issues outlined on this tape, in-person to your group, then hosting a PowerLine workshop might be right for you. 14- The next question asks: “Can I become a PowerLine trainer or facilitator”? If you have personal experience using the planner, and you have good presentation skills: we would be honored to have you as a facilitator on our team. We have a wide variety of teachers. - The most common type of PowerLine trainer is the average planner user who incorporates Mr. Klaybor’s materials into their local training events. Some distributors charge small fees to small groups, while most just teach the skills they’ve learned to their organization for free. When you put on a planner training event, you receive all the profits. All the money you earn is suppose to be used to build your primary program. But our clients concede that the main reason why they teach our system to others is because they love to help others, and that they’ve learned more about the industry than they ever thought possible. You should consider becoming a teacher in an effort to sharpen your “networking skills”. When you think about it, it’s the educator at the front of the room who learns more than the student ever could. For example, if you absolutely had to teach a PowerLine seminar 30 days from now, what would you have to do? As the presenter, you’d have to study the system completely so that you would know what you’re talking about, wouldn’t you? Over the next four weeks of preparation, you’d use every free moment to cram all the money-making PowerLine information into your head. You might be nervous in the days before the seminar, but once in front of the room, you would realize that the audience simply loved your presentation because you exposed them to lots of wonderful information they could use to build their business. After the applause had faded, you would realize that you had been forced to learn all the things you would have never learned on your own. In other words, becoming a generic multi-level teacher has many great side effects. It forces you to learn the material you were supposed to study on your own. - Mr. Klaybor is also excited about his program to develop apprentices. He can not be in 100 cities every week, yet his training program should be taught in 1,000 cities a week. David needs a few talented educators to assist him in spreading his message and fill the demand for his seminars. Do you see an opportunity for yourself with us? PowerLine is only looking for quality people who are looking to “supplement their income” while they’re learning to become better at building their “primary company”. This would present itself as a very powerful win-win situation. Here’s another perk. Standing behind the podium, you will expose yourself to industry enthusiasts that will see you as an “industry expert”. People are attracted to successful distributors who sound like they know what they’re doing. So if you want us to consider you as a PowerLine trainer, start by using the planner to build your business, listen to the training tapes, study the training manual, and then start teaching to small groups of 5 to 10 people. Try to attend as many PowerLine presentation’s as possible, and in no time, you will be smarter than you ever have been in your life, and you’ll be in a position to be scheduled as a PowerLine teacher. 15- Another excellent question asks: “Can I become a distributor”? Sure you can, but we strongly recommend that most of you stay focused on reaching your goals with your primary program. Our company’s mission has always been to help network distributors sell more of their companies products. Your goal should be to make money by “using the planner”… not create profits by teaching or selling our products. But, it is also clear that some select individuals might benefit greatly from a closer relationship with us. In order to become associated with our firm, you must meet certain qualifications. Contact us directly for more information. Like any business, we are seeking to form strategic alliance business relationships with responsible individuals. We only offer our products at wholesale prices to individuals who are registered as re-sale distributors with our firm. People who’ve joined our team, have come up with some pretty creative ways to use our planner to build their primary program. Here’s a good example… We have distributors using our planner as a “door opener” and as a “door closer” as part of their normal business opportunity presentations. Here’s how they use the “door opener” technique. Instead of using the standard approach where you call on a prospect and suggest that they: “stop doing what they’re doing, and start doing what you’re doing”,… our PowerLine team members call on a prospect and say: “I know you’re satisfied with what you’re doing, so I haven’t called to pitch you on my business opportunity. But I have discovered a celebrity endorsed world-class business planner that will assist you in your recruiting efforts. It’s working great for me. If you like, I’ll get you a tape that explains how it works… anyway, I just called to stay in touch and see how things were going”. If your prospect is happy with the program they’re working, they’ll be pleasantly surprised that you did not call to criticize their program and attempt to drag them into your business deal. But if you’ve called to help them and just say hello, you are sure to score points. Using this approach, you’ll earn additional cash while establishing solid relationships with people who might decide to work closer with you one day in the future. Wouldn’t you agree that by using this approach, you change a potentially “adversarial call” into an enjoyable conversation? Their attitude towards you is less negative and much more pro-active and positive. People want to do business with friends. We have many people successfully using this technique to establish long-term relationships with people they never could have approached before. This is a win-win “door-opening” formula, you can’t lose using it. Other PowerLine distributors prefer using our planner as a “door closer”. Here’s how this method works: After they’ve given a prospect a presentation on their primary company’s business opportunity, what oftentimes happens is, the prospect just wasn’t interested in their “offer’. This might be the time to use the “door closer” technique. You might say something like: “It’s clear to me that you’re happy with what you’re currently doing… so friend to friend, let me share a secret with you that has been helping me build my group. We’re using an amazing business planner that’s helping us perform better than we’ve ever performed before. It’s designed specifically for network marketers, and I know you’ll be very interested in learning more about it. I could fax you some information, mail you a tape, or we could meet in person?” The worst thing that can happen to you is, they say “no thanks”. But oftentimes these individuals want to hear more about the PowerLine system. Just like the example earlier, by using our planner, you can get your foot in the door with prospects you know who wouldn’t have joined with you otherwise. Just be the best person you can be, and develop friendships. Over time, they just might end up joining with you or purchasing a bunch of planners. You can’t lose using the “door opener” or “door closer” techniques. Any method that professionally helps you build relationships with prospects should be seriously considered. Perhaps it could work for you too? 16- The next question asks: “What other publications do you offer”? Mr. Klaybor has written six books. If you purchase one, ask David to autograph your book. You never know, if his career continues on its present path, it’s possible that these manuscripts might become a collectors item one day? - His first book created history when it became the only publication in the world to ever have been converted and transformed into a planner…. Isn’t it fascinating that the system we’ve been discussing originally started out as a book! David realized the “planner system” was a great vehicle to teach network marketing distributors. - Tom Peters: who wrote “In Search of Excellence”. David is honored to have been invited to participate in both of these publications. These manuscripts can be found in popular bookstores. - The fourth book, titled: “Books Don’t Work… Unless You Do!”, is a fascinating explanation of how David’s revolutionary teaching technologies actually work. It will expose the sequence of events that tell the reader why Mr. Klaybor’s “first book” was transformed and converted into the PowerLine planner. It also explains, in detail, how individuals can install all the success formula’s contained in the books, tapes and seminar notes they own. The book gives you methods that will enable a person to “convert their knowledge into cash”. - David’s latest book on “personality types” is going to be a best seller. If you’re a person who passively enjoys reading the horoscope section of the paper, you’re going to love this book. David will show you fascinating easy-to-use formulas you can use to better understand yourself and others important to you in your life. You will use this knowledge to build rock-solid relationships and communicate more effectively than you ever have with others. You’ll be entertaining all your friends and co-workers with the neat tips you learn in every chapter. David’s manuscript is a little like the best-selling book: “Men are from Mars, Women are from Venus”, it will provide you with skills that will help you avoid conflict and deal with problems thrown at you by others. Once you start reading this book, you’ll never put it down. In fact you’ll buy’m by the case so you can pass them out to everyone in your life. David will be doing seminars on this topic too. You will want to teach this class to your group. 17- A distributor asks, I’ve seen David wearing a gold lapel pin, where can I get one? Although David sets himself apart from other speakers by focusing on skill-sets more than he does on inspirational topics, he understands how vital it is to have a “positive attitude”. He feels so passionately about this attribute that he actually manufactures two lapel pins… one says “Attitude”, the other says “Create Wealth”. Both have large, thick, gold-plated lettering that goes well with any man or women’s attire. Each pin has a brilliant sheen and the large lettering can easily be read from afar. Both pins are designed to become “people-magnets”… if you ware one of these pins every day, you will have a handful of new people commenting on how nice the pin looks. If your presentation skills are good, you will convert the $15 price of the pin into thousands of dollars in profits! It’s a great way to have people approaching you, instead of you always having to find a clever way to approach them. Let the “pin” strike-up a conversation with new prospects, and then use our planner to communicate effectively to “close the deal”. This is a great example of a superb two-part success technique. It’s also a great gift idea for the person in your group who is always positive, smiling, and forever trying to help people… or conversely, you might try to use the pin to improve the attitude of a grumpy person who is always trying to find something wrong in the world. The pin might just force them to change into the nice person they have buried deep inside. The “create wealth” pin should be worn by people who want to attract people who are looking for a new business opportunity. If you buy this pin, you must be able to explain to people how they’ll be able to make more money. None of our pins are anything like the cheap one’s you may have seen in magazines. Ask us about our volume purchase discounts so you can get these pins in the hands of all the leaders in your group. We also carry another product you can give as a gift to persons you care about who are forgetful or are great procrastinator’s. If you know a person who can’t prioritize items on their to-do lists, or have a hard time finishing projects… we market an amazing product that can cure all these bad habits? What is it you ask, it’s the “Round TUIT” coin! This gold colored coin is about the same size as the old American Eagle one dollar piece, but a fraction of the weight so it travels-light in your pant-pocket. The brilliant concept behind this metal coin is for the user to where it around their neck or carry it in a pant pocket so it can serve as an hourly reminder for you to GET AROUND TO doing the money making tasks you’re always forgetting to do. And if you carry the coin, you are certain to do more productive items, more often. This $10 coin is guaranteed to help you make more cash! You can save money with volume purchases. In summary, here are the main points to remember. - The power-line system is not just a day-planner, it’s your complete Business System. It is unlike anything you have ever seen. It contains a dozen powerful independent “systems”, that are combined into one convenient carrying case. All twelve of these systems were carefully dovetailed together by a self improvement scientist who is endorsed by most of the greatest minds in the network marketing industry. - Nobody on the planet has as much experience as Mr. Klaybor in helping distributors get organized, follow-up, and manage their events. David’s training is unlike anything you have ever heard. - How many industry leaders focus on motivation? Almost all of them do… Now how many sales trainers focus on teaching you skill-sets?… Only David Klaybor and a handful of others. - We proved that we could help you communicate better than you ever have in your life. - We proved to you how important it is to have information “where you need it when you need it”, and gave you a system to do it. - We reminded you how strong your resume’ is and how weak your bank balance is… and we proved to you that the planner was the bridge that will help you “turn your knowledge into cash”. - You understand that the planner may look a bit complicated, but it’s just an “optical illusion”… An eighth-grader could use the planner it’s so simple and easy-to-use. - You can purchase the planner through all the best industry catalogs because it’s endorsed by countless MLM experts. These celebrities give a thumb’s-up to David and his products because they know that his tools have helped thousands, and because they know that he’s given up his life to create the best planner money can buy. - The planner costs you nothing because it is designed to help you increase your cash flow. - Besides having all your business stuff with you in one place, you’re going to look like a “professional” carrying the planner. You’re going to become more competitive against the millions of other distributors trying to work their business without our system. When people see you carrying our system, they’re going to say, “Hey that cat really looks like they know what they’re doing”… as compared to all the other mlm maniacs that are trying to get people in a multi-level deal. - Normal distributors are going to be frustrated, stress-out, and pressured because no one wants to join their deal and no one wants to buy their product… but you are going to be cool, calm and collected because your sponsoring new people every month and your check is constantly on the rise. - We’re going to help you clean up the mess on your desk so they’ll be no more digging, sorting, and shuffling for your business information anymore. - You’re going to follow-up more than you ever have in your life. - We explained that the planner is as easy-to-use as an encyclopedia, dictionary or a telephone book. - We’ll help you gain so much success that you’ll be able to get up late, walk around your dream house in your underwear ‘till noon, and drive your luxury sedan to the country club for dinner with the governor. - We said you could probably put your “pitch book” inside the planner. - We established the fact that David is a time management expert for normal people whom generally dislike time management training. - David will help you teach your downline via a program he calls, “the Power Call” . All you have to do is put a conference call together with as few as 10 people or hundreds. Link them up via 3-way call technology or employ the services of a professional conference call company. You could have people all sitting around the living room in a farm house in Des Moines or hook-up David on a speaker-phone linked into the PA system in a hotel room filled with people. Mr. Klaybor has performed as many as ten of these calls in one day, so do not think he’s unavailable. He could participate in your New York event even if he was in Australia! Use him to increase attendance, or use him to get people excited. He’s been known to add humor and other times he’s so powerful he makes the paint melt!